Mindy L. Mallory is an associate professor in the Department of Agricultural and Consumer Economics at the University of Illinois. Dr. Mallory’s research focuses on commodity markets and marketing issues, especially related to commodity futures and options markets. Topics of special interest include forecasting, liquidity costs, and price discovery. Additionally, NSF-funded research examines how portfolio theory from finance can be applied to help conservation groups make informed resource allocation decisions in the face of climate change. Climate-change induced uncertainties in future spatial patterns of conservation-related outcomes make it difficult to implement standard conservation-planning paradigms. A recent study translates Markowitz's risk-diversification strategy from finance to conservation settings, enabling conservation agents to use this diversification strategy for allocating conservation and restoration investments across space to minimize the risk associated with such uncertainty. However, this method is information intensive and requires a large number of forecasts of ecological outcomes associated with possible climate-change scenarios for carrying out fine-resolution conservation planning. We developed a technique for iterative, spatial portfolio analysis that can be used to allocate scarce conservation resources across a desired level of subregions in a planning landscape in the absence of a sufficient number of ecological forecasts. We applied our technique to the Prairie Pothole Region in central North America. A lack of sufficient future climate information prevented attainment of the most efficient risk-return conservation outcomes in the Prairie Pothole Region. The difference in expected conservation returns between conservation planning with limited climate-change information and full climate-change information was as large as 30% for the Prairie Pothole Region even when the most efficient iterative approach was used. However, our iterative approach allowed finer resolution portfolio allocation with limited climate-change forecasts such that the best possible risk-return combinations were obtained. 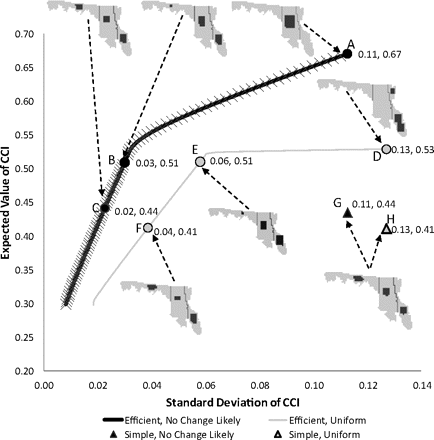 With our most efficient iterative approach, the expected loss in conservation outcomes owing to limited climate-change information could be reduced by 17% relative to other iterative approaches. We develop and evaluate quarterly out-of-sample individual and composite density forecasts for U.S. hog prices. 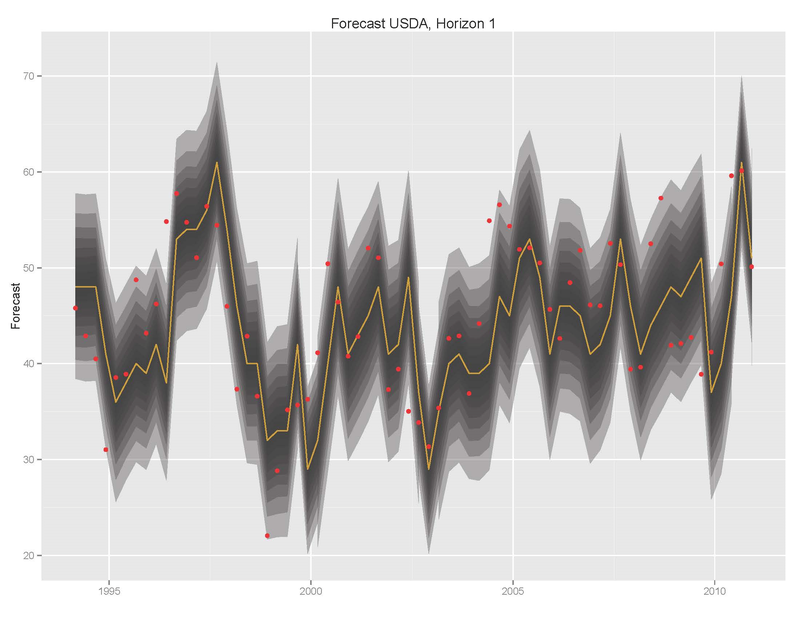 Individual density forecasts are generated using time series models and the implied distributions of USDA and Iowa State University outlook forecasts. Composite density forecasts are constructed using linear and logarithmic combinations of the individual forecasts and several weighting schemes. 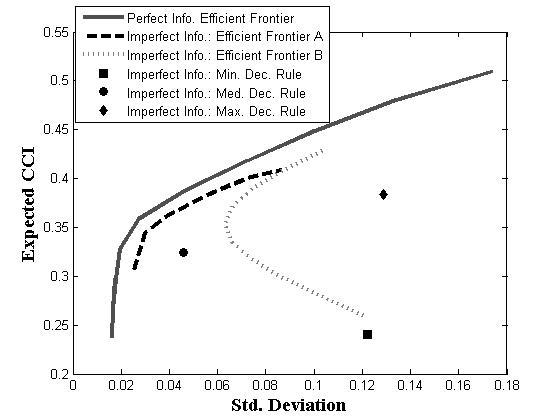 Density forecasts are evaluated on predictive accuracy (sharpness), goodness of fit (calibration), and their economic value in a hedging simulation. Logarithmic combinations using equal and mean square error weights outperform all individual density forecasts and are modestly better than linear composites. Comparison of the outlook forecasts to the best composite demonstrates the usefulness of the composite procedure, and identifies the economic value that more accurate expected price probability distributions can provide to producers. We characterize an optimal hybrid policy for pollutant emissions that includes a permit price ceiling and emission cap in a multi-period model. Previous studies have primarily focused on a hybrid policy of emission regulation that included an emission cap and permit price ceiling in a single period model, we extend this literature by developing such an optimal hybrid model in a multi-period framework where banking and borrowing of emission permits is allowed. 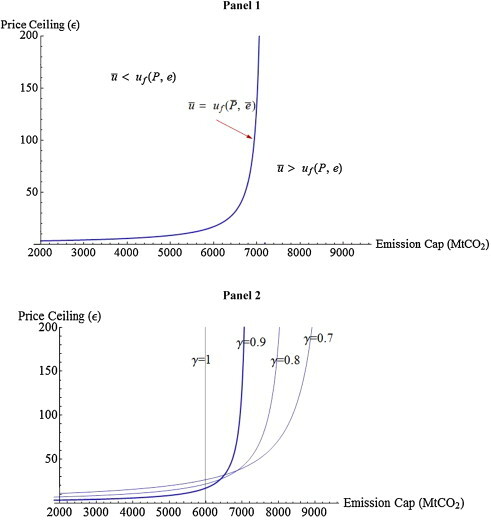 In our model, we compare the case of a regulator who sets the emission cap and price ceiling to be consistent with a long run emission objective with the case of a regulator who occasionally is motivated to deviate from the optimal long run regulatory policy in order to correct for unexpected but exceptionally high emissions. Using a discrete dynamic programming model with stochastic emissions, we show that the hybrid model gives the regulator a degree of freedom in making an optimal price and quantity choice. 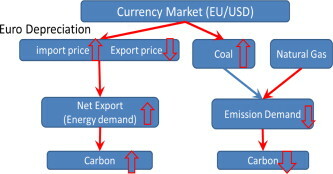 This paper examines the impact of currency exchange rates on the carbon market. We scrutinize this effect through the European Union Emission Trading Scheme (EU-ETS), which primarily uses two substitutable fossil energy inputs for the generation of electricity: coal and natural gas. The European coal market is directly driven by global coal markets that are denominated in USD, whereas, natural gas is mainly imported from Russia and is denominated in Euros. The impulse response functions of a Structural Vector Autoregression (SVAR) model demonstrate that a shock in the Euro/USD exchange rate can be transmitted through the channel of energy substitution between coal and natural gas, and influence on the carbon credit market. 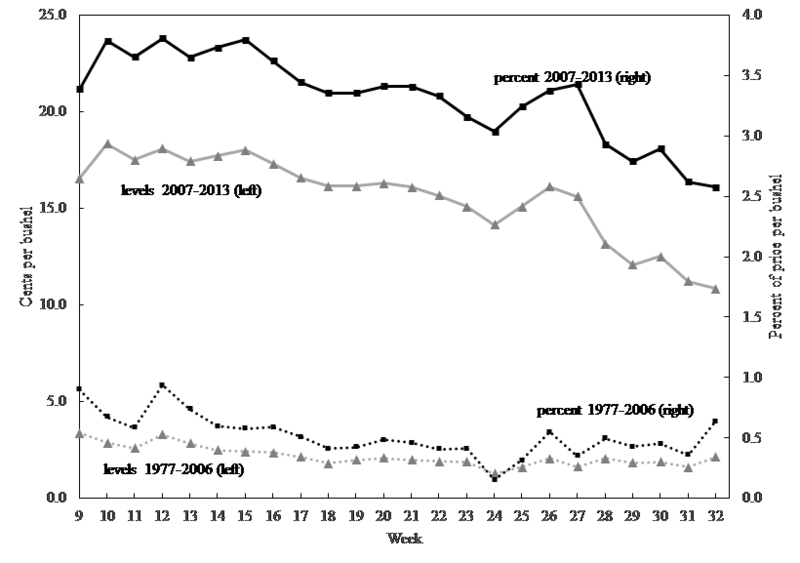 This study estimates the cost of forward contracting corn and soybeans for January and March delivery from 1980 through 2009. 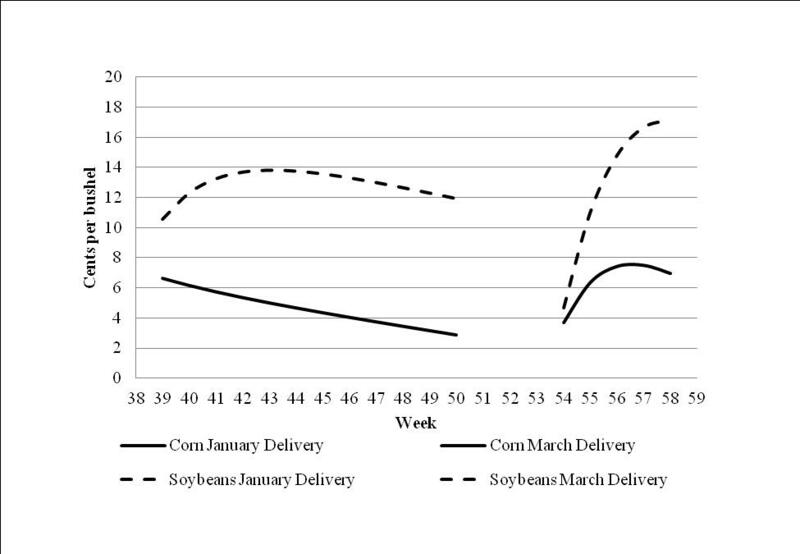 Both corn and soybeans exhibited a downward trend in the cost of forward contracting for January delivery, in contrast to previous pre-harvest results, and the March delivery cost of forward contracting is slightly downward sloped. The cost of post-harvest forward contracting corn and soybeans averaged 2 cents and 6 cents respectively; this was much less than the cost of pre-harvest forward contracting in recent years. We did not find an increase in cost associated with income shifting associated with January delivery. We conclude that January forward contracts offer a relatively inexpensive means of smoothing income across years. Modern tools for cost-effective conservation reserve site planning require the planner to have information about spatial distributions of conservation costs and benefits. Climate change creates unprecedented uncertainty about future land values and species habitat ranges, such that conservation scientists cannot map costs and benefits with certainty anymore. This paper contributes to the literature on the economics of conservation in the face of climate change uncertainty. 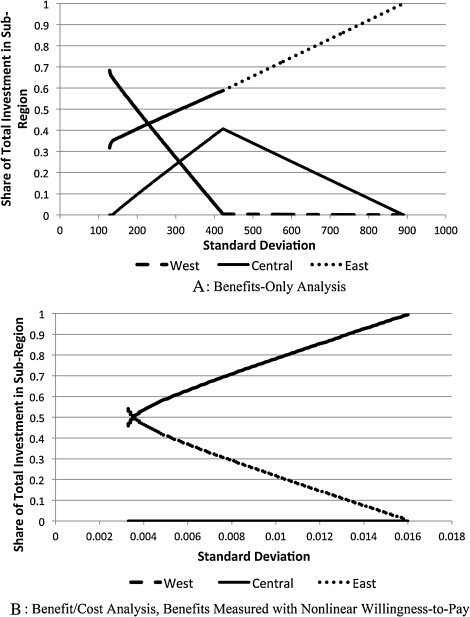 It advances a new method for using modern portfolio theory to choose lands to protect that yield total conservation returns with less uncertainty. It explores the implications for portfolio recommendations of variation in the correlations between ecological and land-value responses to climate change. It also tests the robustness of the method to shortcuts that might be taken to simplify analysis, identifying problems that arise if conservation costs are ignored in portfolio analysis and demonstrating when portfolio recommendations are sensitive to how ecological benefits are quantified. This article analyzes recent volatility spillovers in the United States from crude oil using futures prices. Crude oil spillovers to both corn and ethanol markets are somewhat similar in timing and magnitude, but moderately stronger to the ethanol market. 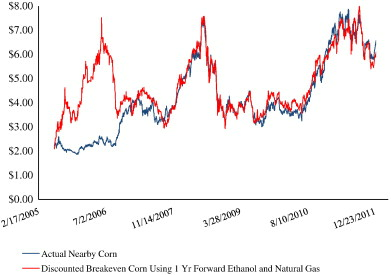 The shares of corn and ethanol price variability directly attributed to volatility in the crude oil market are generally between 10%-20%, but reached nearly 45% during the financial crisis, when world demand for oil changed dramatically. 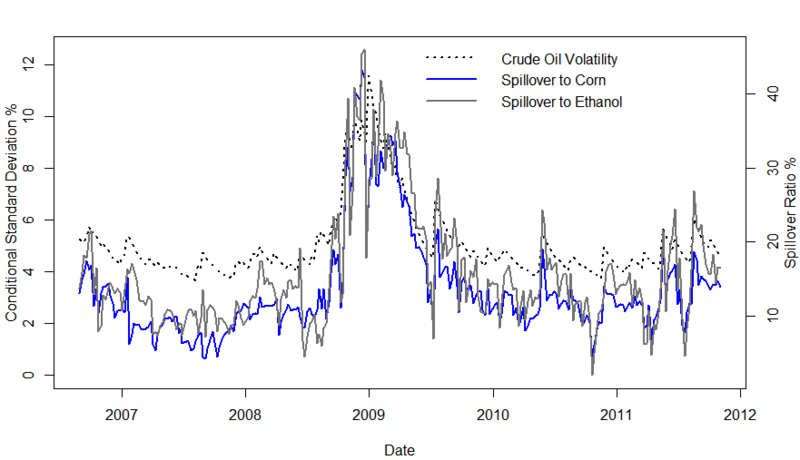 Volatility transmission is also found from the corn to the ethanol market, but not the opposite. The findings provide insights into the extent of volatility linkages among energy and agricultural markets in a period characterized by strong price variability and significant production of corn-based ethanol. 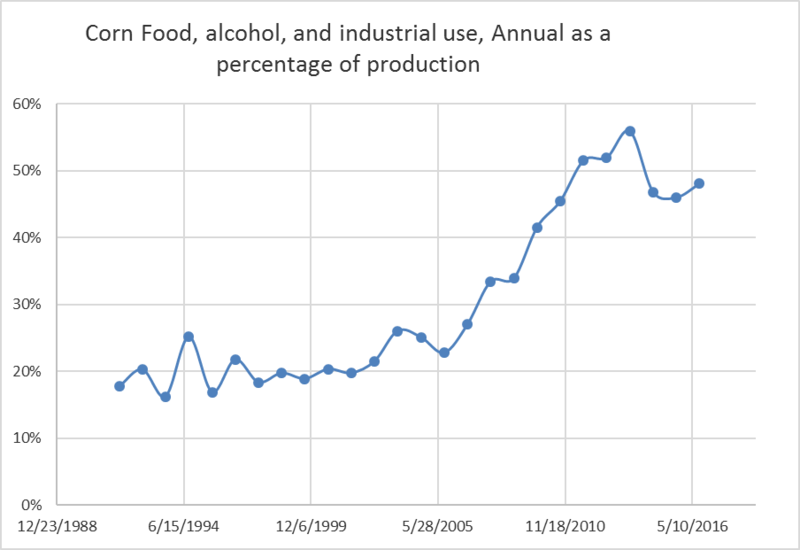 This article uses the theories of market efficiency and supply of storage to develop a conceptual link between the corn and ethanol markets and explores statistical evidence for the link. We propose that a long-run no-profit condition is established in distant futures markets for ethanol, corn and natural gas and then use the theory of storage to define an inter-temporal equilibrium among these prices. The relationship shows that under certain conditions, future price expectations will influence nearby futures prices and that a short-term relationship between input and output prices will exist. We demonstrate validity of the theory using a structural price model and then by means of time-series techniques. This paper examines the role of uncertain crude oil prices, uncertain crop yields, and competition for acreage on corn, soybean, and switchgrass prices under biofuel production mandates. We find enforcement of the cellulosic mandate is costly in that it raises equilibrium prices of all three crops through competition for acreage. However, crude oil prices largely determine industry profitability even in the face of high crop prices. Further we find that uncertainty in crude oil prices and crop yields causes higher corn, soybean, and switchgrass prices compared to a baseline with no uncertainty. A work-in-progress book for beginners on commodity price analysis from a fundamental perspective. Target audiences are upper level undergraduate students, or professionals beginning a career related to commodity markets. The objective is to familiarize the reader with the sources of market information and research commonly used by practicing professionals working in the industry. Follow the link the explore the web applications I have made. Most relate to commodity markets or finance in general. Microeconmic Analysis (ACE 500): This is standard first-year master’s theory class. It has a heavy emphasis on core neoclassical economic theory, with some modern extensions. Commodity Price Analysis (ACE 427): Students learn what drives prices in commodity markets. First we cover fundamental supply and demand characteristics of key commodity markets like corn, soybeans, and wheat, livestock and energy. Considerable time is spent introducing the student to important sources of information (from the United States Department of Agriculture, e.g.) that are critical to market participants. Commodity Futures Markets (ACE 428): Students gain a working knowledge of commodity futures and options markets. We cover the markets’ role as an economic allocation mechanism, describe intuitively and analytically the relationship between a commodity’s cash, forward, and futures prices, price option contracts according to some popular models, and implement a risk management strategy that includes hedging on a commodity futures exchange.